WAR veterans have blamed the opposition for working towards inviting more problems for the country through sanctions. 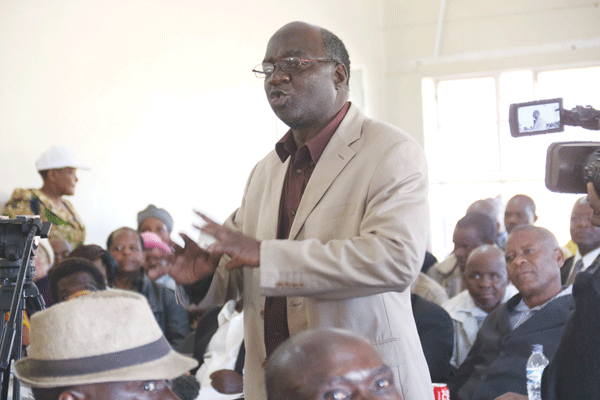 Zimbabwe National Liberation War Veterans' Association spokesperson Douglas Mahiya yesterday accused the MDC of "conniving" with former colonisers and global capitalists to cause chaos in the country, and urged patience with Mnangagwa. "With these few days in power, what kind of miracle can be done to turn around the economy when we had 38 years of waste under Mugabe?" he asked rhetorically. "We have come a long way and this new dispensation is very young and has been in power for a few days. Why can't people give it time? Why not allow ED to go a while and look at things positively than to continue the political onslaught against Zanu PF and ED when he has done nothing? But the MDC Alliance youth assembly urged Zimbabweans to unite and pile pressure on the government to resolve the deepening economic crisis. They said Zimbabweans must unite and kick out Mnangagwa in the same manner that the citizens united against former President Robert Mugabe last November. "Let's unite as Zimbabweans and deal with the current regime the same way we dealt with Mugabe," the MDC youth assembly secretary-general Lovemore Chinoputsa said yesterday. "The environment is ripe for people to use their power to rein in an incompetent regime. We now want to build a strong force in the country that will liberate Zimbabweans once and for all." The country's economic situation has worsened since the central bank announced new monetary measures last week, with prices of basic commodities skyrocketing, while in some instances, the commodities have disappeared from shelves of supermarkets. The country is also experiencing fuel and flour shortages. Mahiya, however, said the blame game would only make things worse for Zimbabwe, adding that continuously talking bad about the country would only worsen the situation. Mahiya said war veterans were ready to create a forum where people could contribute solutions to solve the current crisis.